Not quite sure which ATV Adventure tour is right for you? At ATV & Jeep Adventure Tours we believe in offering a variety of tour lengths to accommodate all of our guests. We offer three different tour lengths so there is always an option to suit everyone’s needs. Our adventure tours include the “Sandstone Teaser” which is a 3-hour adventure tour, the “Rattle Snake Round-Up” that is 4 hours in length (the most popular tour) and lastly, the “Red Rock Rally” full day adventure with a tour length of 5 hours. 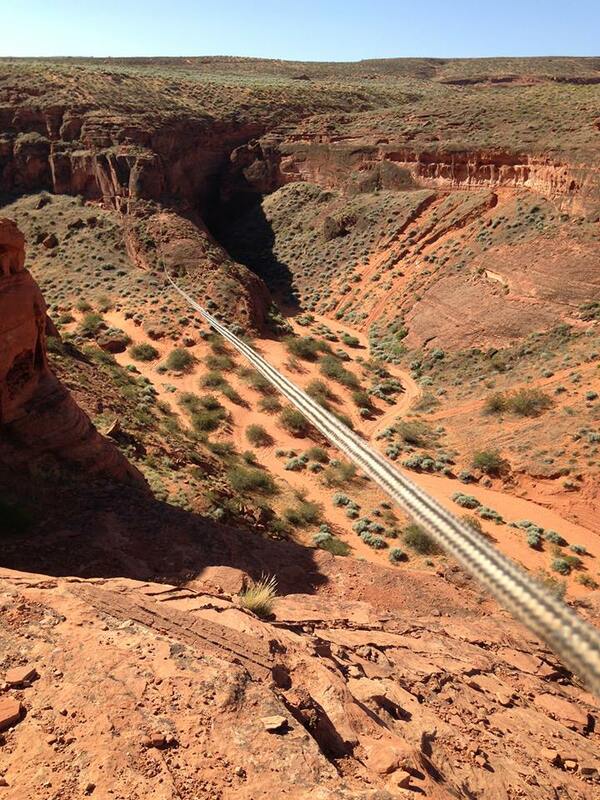 We are also happy to say we now offer an add-on of the longest Zipline and Rappel in Southern Utah! 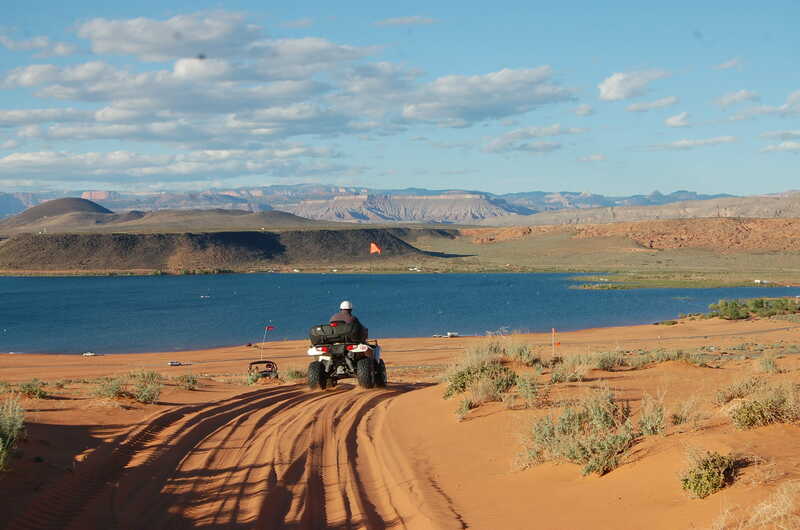 The Sandstone teaser 3-hour ATV adventure tour climbs halfway up the gorgeous Red Plateau of Sand Hill in Sand Hollow State Park and passes through red rock monuments with spectacular views of lakes and different mountain ranges. This tour covers 15 – 20 miles and you are able to reach the minor sand dunes where there are typically smaller sand hills and bowls we love to treat our guests to. This tour is a full loop so there is no backtracking on the ride and new terrain is covered throughout. This is a great tour for those who are limited on time and just want to get out into the beautiful backcountry of Southern Utah. You will take home some amazing photos and lasting memories. Just be warned, the time goes by rather quickly and this tour will leave you wanting more. Our guests usually tell us they will be back for a longer tour. This tour is suited for someone that is short on time and still wants to hit the sand dunes. Our half day, 4 hour, ATV tours rise to an elevation of about 3500 feet with spectacular views of lakes and different mountain ranges. You will often see the entire St. George Valley as well as all the way to Zion National Park and Gooseberry. You will climb high enough to reach the MAJOR Sand Dunes where the BIG hills and sand bowls are located. Nothing beats the rush of driving down the big sweeping hills or driving higher and higher on the sand bowl! We also include a “SAND BALLET”, an experience you will never forget! You will also go to a huge box canyon where your imagination can run wild with thoughts of this being a hiding place for the outlaws back in the day. This tour is a progressive trail experience where you gradually gain more confidence in your driving abilities and each person is at their own comfort level, we do not push anyone to go outside their comfort level. Remember safety is our # 1 concern and all of our guides know how to be safe yet give you an adventure of a lifetime. This tour is suited for anyone from the very beginner rider to the more advanced rider. The full day, 5 hour, ATV adventure tour is packed full of action and adventure. It covers all the riding area of our Half Day Tour including “Jurassic Park”. Jurassic Park is an amazing area where mother nature has crafted out the sandstone hills to look like various per-historic creatures, sculptures, faces and one hill even looks like a huge cruise ship. You’ll have time to stretch your legs, hike around, climb on the creations and take amazing photos. You’ll enjoy a delicious picnic lunch and be able to swap stories about everything you have done and seen so far. Our guides will also be able to spend more time in the major sand dunes where all the huge hills and sand bowls are located as well as take you out to the “Flintstone House”. This is creation of mother nature that takes you back to the era of the Flintstones cartoon. Listen careful and you just may think you hear Barney and Fred saying “Yabba Dabba Do”! This tour covers 27 – 30 miles, so keep your eye peeled for the rock formations that look like a gigantic turtle or even a dinosaur head! Our ATV Adventures are something that you will never forget and are something you will experience in no other place in the world. This tour is suited for anyone from the very beginner rider to the more advanced rider. We have recently paired up with our good friends at Paragon Adventures to offer something so unique, you won’t find it anywhere else! 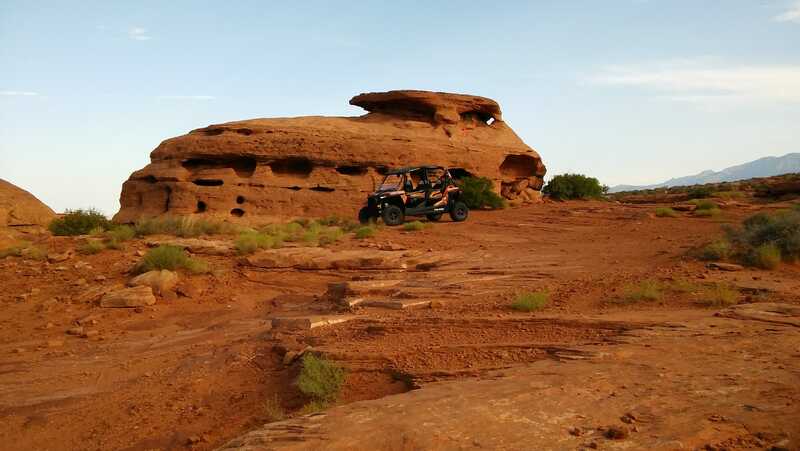 Ride ATV’s in the beautiful southern Utah desert and then zipline 800 exhilarating feet over a beautiful box canyon where the colors of the canyon walls will amaze you. When you get to the other side you will have the option to rappel down a sheer cliff wall as well as challenge yourself with a couple of great rope ladders to get back to the top. After experiencing this amazing adventure tour, you will never look at adventure quite a the same.